Click thumbnails for full size, scaled to a new window. George Nieuwenhoven ... "..pot stays on the ground to keep it as cool and humid as possible, the scent is rather like a Gardenia." Tillandsia venusta Mez & Werckle in Mez, Bull. Herb. Boiss. II. 5: 108. 1905. Floral bracts elliptic, acute, distinctly shorter than the sepals, two to four times as long as the internodes, ecarinate, prominently nerved, membranaceous; (16-19 mm long, broadly ovate at the base tapering to an incurved, thin, slightly nerved, sharpely folded toward the apex, ecarinate to carinate, reddish-brown to tan in color;) Flowers dense, but subspreading so that the rhachis is completely exposed, sessile, faintly sweet-scented. Stamens free, equal, 7 mm long, deeply included; pistil 6 mm long; ovary ovoid, as long as the style. Type. Werckle in Brom. Costaric. 95 (holotype B, F photo 11534), near Turrialba, 600 m alt, Cartago, Costa Rica. DISTRIBUTION. Known from the type collection only. Ecuador is home to a number of very ornamental and much cultivated members of Tillandsia subgenus Phytarrhiza; of these, T. cyanea is probably the best known. This relatively easily recognized group can be characterized by having broad, spreading petal blades and very short stamens and style. The majority of the Ecuadorian species are mesic epiphytes although two species (T. caerulea and T. straminea) are adapted to rather harsh, xeric environments. Many of these plants have been introduced into cultivation, often under incorrect names. While checking the voucher specimens for the Flora of the Rio Palenque Science Center (Dodson & Gentry, 1978) I realized that the plant identified as Tillandsia dyeriana Andre was incorrectly determined. 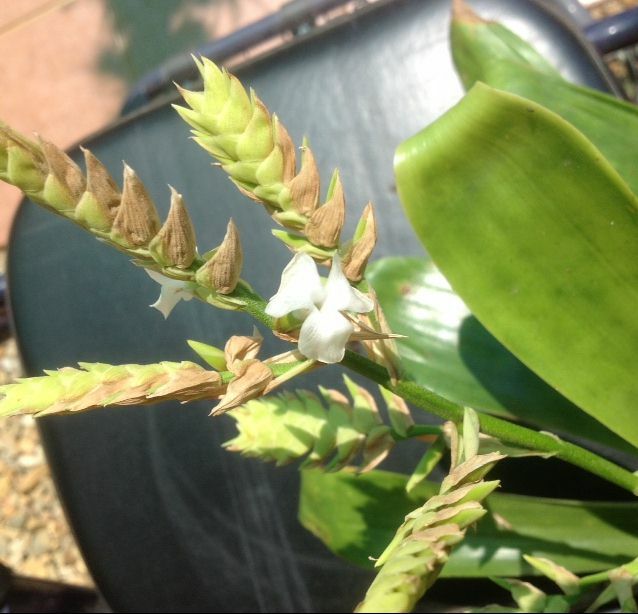 Tillandsia dyeriana is a plant of rather few leaves arranged in an erect, sub-bulbous rosette and has floral bracts that much exceed the flowers. The Rio Palenque plant has an open, spreading rosette of 15-25 leaves with the flowers much exceeding the floral bracts. In addition, the flowers of the Rio Palenque taxon are 2-3 times the diameter of those of T. dyeriana. Comparison of the Rio Palenque plant with the plate accompanying the original description of T. dyeriana shows that these are two distinct species. Confusion of these two taxa has not been limited to this one publication as Rauh (1970) had some years earlier published a photograph of this plant as T. dyeriana. More recently (Rauh, 1979) he stated that the material previously illustrated as T. dyeriana was probably the same as T. nubis Gilmartin. The description of Tillandsia nubis Gilmartin (Gilmartin, 1968) indicates that this species has large (up to 45 mm long) violet petals. Examination of the type specimen of T. nubis at US confirms this description. 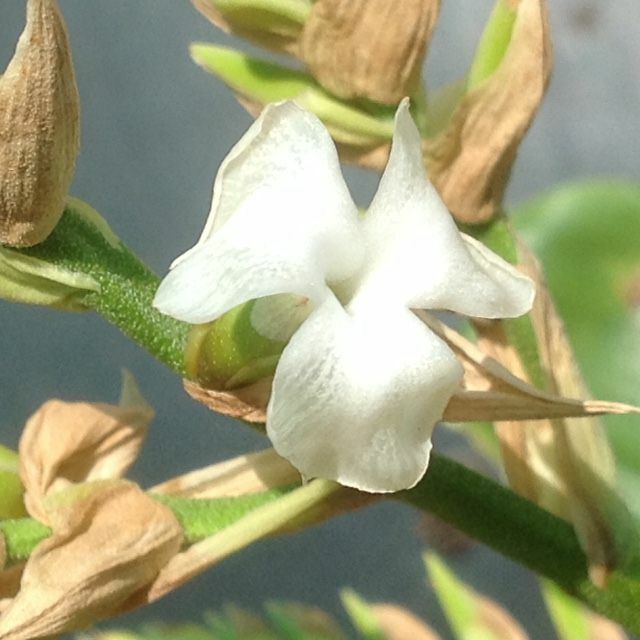 The plant previously misidentified as T. dyeriana has small (to 25 mm long) white petals. Also the floral bracts of T. nubis are much narrower toward the base than those of the white flowered taxon. In shape and size they closely resemble those of T. hamaleana E. Morr. , another violet or blue flowered species that is abundant at the type locality of T. nubis (pers. obs.) Further collections will be necessary in order to determine if these two taxa are distinct. 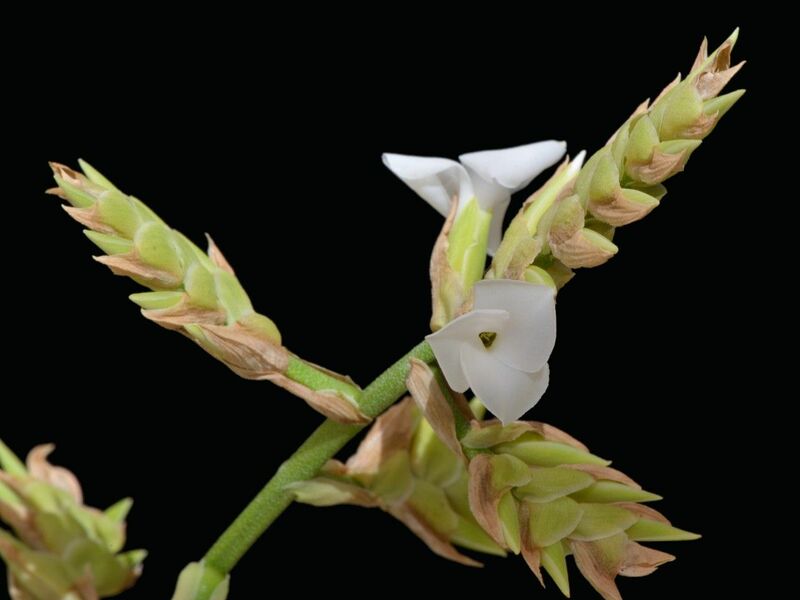 Because the white flowered plant could not be identified as either Tillandsia hamaleana or T. nubis and since no other Phytarrhiza tillandsias from the northern Andes seemed to be at all related I was prepared to describe this plant as a new species closely allied to T. nubis. In January 1981 Mrs. Georgia Waggoner of Morris, Oklahoma sent to the BIC a number of freshly cut specimens acquired by her and her husband on a plant collecting trip to Costa Rica. Among these was a specimen that was unmistakably the same as the white flowered Ecuadorian plant. My first impression was that a mixup had occurred and that the wrong collection data had been sent. Mrs. Waggoner replied that no mistake had been made and she remembered the plant in question being plucked from a tree. What I had originally believed to be an Ecuadorian endemic appeared to have a much more extensive range, not impossible since two of its relatives (T. anceps and T. monadelpha) are found over a considerably larger area. A check of the recorded tillandsias from Central America showed that this relatively common Ecuadorian species was very close to a rather obscure Costa Rican plant described by Mez and Werckle early in this century as T. venusta. The type specimen of Tillandsia venusta Mez & Werckle consists of a rosette and a detached, shattered fruiting inflorescence. Only two floral bracts are visible on the Field Museum photograph of the type specimen but they show the broadly ovate base of the floral bract that is characteristic of the Ecuadorian plant. The description of T. venusta states that the floral bracts are not incurved and are ecarinate. Careful examination of the photograph reveals that the one nearly entire floral bract is somewhat incurved at the apex and appears to be sharply folded. The floral bracts of the new Costa Rican collection are quite distinctly incurved and are ecarinate to slightly carinate at the apex. The floral bracts are rather thin and it is often difficult to tell if the bract is actually keeled or merely nerved and sharply folded. In all other characters the new Costa Rican collection and the plants from western Ecuador fit nicely within T. venusta and I consider them to be conspecific. Following is a description of Tillandsia venusta based on fresh material from Ecuador and Costa Rica: Tillandsia venusta Mez & Werckle, Bull. Herb. Boiss. 11.5: 108.1905. Capsules cylindric, 33 mm long. Costa Rica: Cartago: Near Turrialba, 600 m alt. Werckle in Brom. Costaric. 95 (B, Type; F photo 11534); Alajuela: 10 km west of Volcan Arenal, 750 m alt., Nov. 1980, C. & C. Waggoner s.n. (SEL). Ecuador: Los Rios: Rio Palenque Science Center, alt. ca. 150-220 m, 8 June 1974. C.H. Dodson 5531 (SEL), same locality, 3 Feb. 1980, J. Watson 286 (USF); Pichincha: Selva Nigra, Naundorff s.n. (US), cultivated by Milstein s.n., Dec. 1967; Canar: El Tambo to Ouayquil, alt. ca. 920 m, 14 Aug. 1965, Gilmartin 1186 (US); El Oro: Km 19, Pinas to Santa Rosa, alt. 460 m, 7 Oct. 1979, Dodson et al 8921 (SEL); Without locality: Couthoy s.n. (OH). Tillandsia venusta is distributed in the trade and is a horticulturally worthwhile species due to its attractive habit and fragrant flowers. The accompanying illustrations prepared from living plants of documented wild collections at Selby Gardens and my comments are presented for the purpose of ending, finally, the confusion surrounding the identities of Tillandsia dyeriana Andre and T. venusta Mez & Wercle. 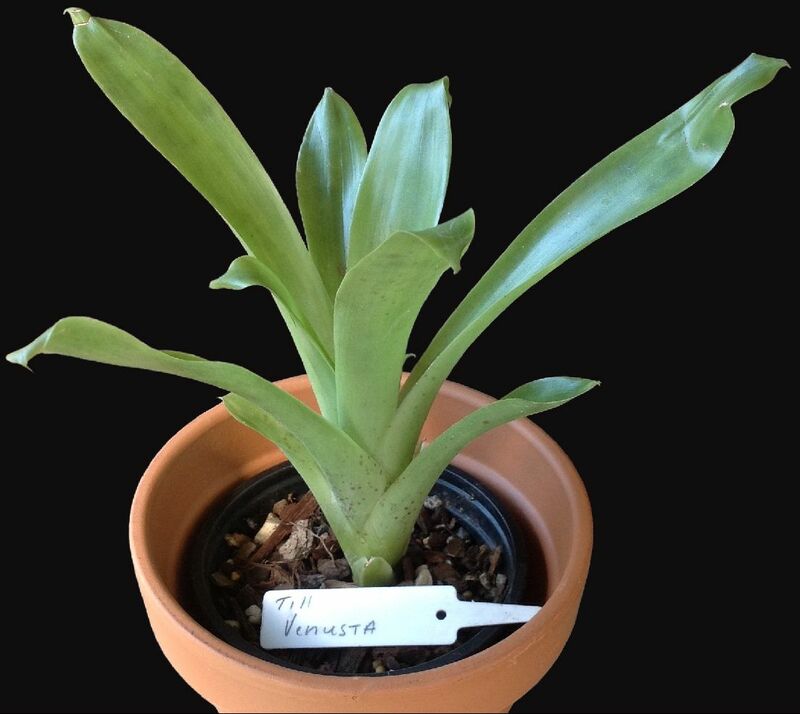 T. dyeriana has been established in North American and European horticulture for not more than nine or ten years. It is often sold under the synonym T. rutschmannii Rauh (Rauh 1974, 1979). T. venusta, on the other hand, has been in limited cultivation for the past fifteen years at least, but only recently was it correctly determined (Luther, 1982). T. dyeriana (fig. 5), from the wet lowlands of western Ecuador, is characterized by small diurnal flowers which turn black after ten to fifteen hours. No scent has been detected from them. The combination of brilliantly colored floral bracts, odorless day flowers, and a rather heliconia-like inflorescence predicts that this species is adapted to hummingbirds as a pollen vector. This condition is a novelty in Tillandsia subgenus Phytarrhiza where all other taxa seem most suited to moth, bee, or, possibly butterfly pollination. T. venusta (fig. 6) has been collected in Costa Rica (the type locality) and western Ecuador, but nearly all of the cultivated material is of Ecuadorian origin. The white, fragrant flowers, larger than those of T. dyeriana, last for up to twenty-four hours and are probably pollinated by nocturnal moths, although the production of fragrance through the day suggests that bees may also be pollinators. Both species can be recommended for cultivation. 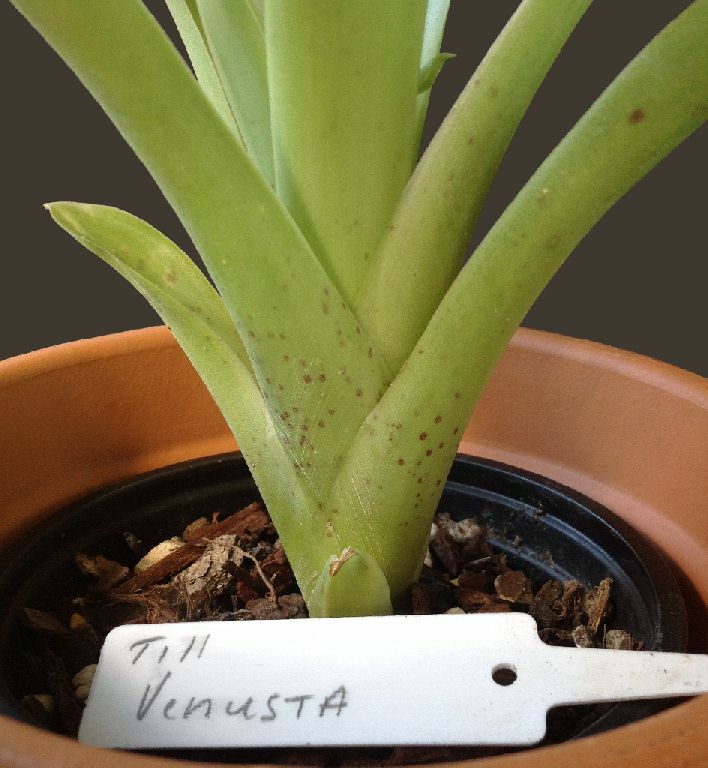 T. venusta seems somewhat easier to manage because it grows well when mounted (with adequate moisture) or potted and given vriesea conditions. 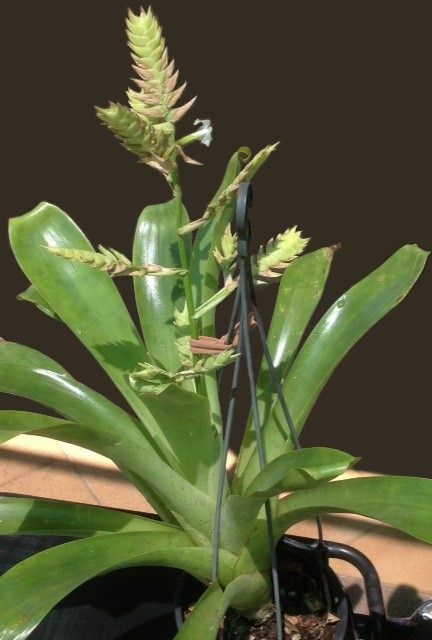 T. dyeriana collected plants presented some problems initially and have been most successful when mounted on cork bark. Fully domesticated plantlets will probably be more tolerant. The spectacular coloration of the latter species certainly makes any extra efforts on the part the grower a worthwhile endeavor.